Successful Greens Queensland Senate candidate Larissa Waters has made Saving Straddie one of her top three priorities after her success in the recent Federal election. 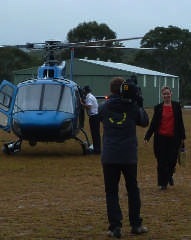 On the campaign trail... Greens Senate candidate arrives on Straddie during the election campaign after inspecting damage done by mining from the air. During the campaign FOSI organised for Larissa to inspect the damage being done by Unimin’s sand mines from the air. Visit www.savestraddie.com to read the Greens’ statement. Spreading the word... Successful Greens Senate candidate Larissa Waters speaks to the media about Saving Straddie.